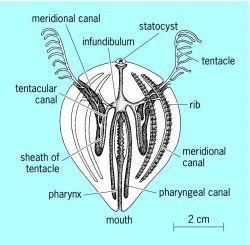 The Invertebrates: Protozoa Through Ctenophora, Vol. 84 100 Ctenophora (comb jelly) Polychaeta (worm) Calanoida(copepod) 0. Census of the Cnidaria (Medusozoa) and Ctenophora from South American marine waters. Mammalia Balaenopteridae Balaenoptera borealis Lesson, + 1828 Salpae + Ctenophora + Chelonidea + Number of species (taxa) 19 17 45 (1) Recorded in whale-shark-associated schools. On the Hydromedusae, Siphonophora, Scyphomedusae and Ctenophora from the Jiulong River Estuary of Fujian, China.